At the Versailles Dental Clinic, we believe that you should be able to base your dental care decisions on the knowledge and understanding you gain from a variety sources and not solely on recommendations from your dentist. We want to show you first-hand how we can help and what is going on with your dental health. This is why we've invested in the intraoral high-resolution camera— a highly advanced hand piece of diagnostic equipment that allows you to see what exactly the dental surgeon sees inside your mouth with extreme precision. While X-rays and mirror exams provide valuable information about your teeth that you cannot get from any other source, it doesn't show everything going on inside your mouth. 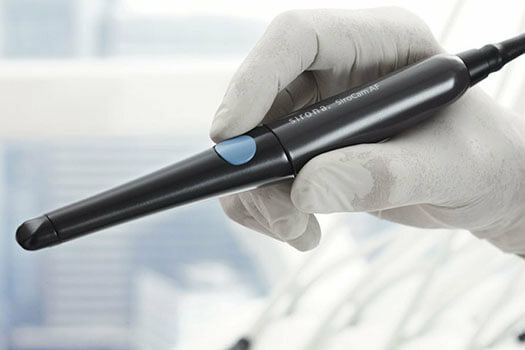 The intraoral dental camera handpiece is approximately the size and shape of a dental mirror. It has a built-in light source and up to 50 times magnification that allows the dentist to take high-quality images of your teeth surfaces and give you a “video tour” of your entire mouth. The images are displayed in full-colour on a wide screen monitor to allow you to see problems such as worn or broken fillings, cracked teeth, plaque DEPOSITS, cavities, excessive wear, occlusion issues, prematurities etc. Images are saved to provide a concise permanent record of your treatments. Images can be printed to take home. Enlarged images from this high-resolution camera mean a faster diagnosis from the dentist and less chair-time for you. The Endo or inter-oral camera is a highly advanced piece of diagnostic equipment that allows you to see what we see inside your mouth with extreme precision. There is valuable information that we cannot get from regular x-rays and examinations because the Endo Camera allows us to see 25 times magnification and take still digital photos in the process of the exam which can be used throughout your treatment process.